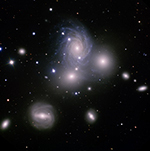 Four unknown galaxy clusters each potentially containing thousands of individual galaxies have been discovered some 10 billion light years from Earth. An international team of astronomers, led by Imperial College London, used a new way of combining data from the two European Space Agency satellites, Planck and Herschel, to identify more distant galaxy clusters than has previously been possible. The researchers believe up to 2000 further clusters could be identified using this technique, helping to build a more detailed timeline of how clusters are formed. Galaxy clusters are the most massive objects in the universe, containing hundreds to thousands of galaxies, bound together by gravity. While astronomers have identified many nearby clusters, they need to go further back in time to understand how these structures are formed. This means finding clusters at greater distances from the Earth. The light from the most distant of the four new clusters identified by the team has taken over 10 billion years to reach us. This means the researchers are seeing what the cluster looked like when the universe was just three billion years old. Astronomers are inviting the public to search Hubble Space Telescope images of the Andromeda galaxy to help identify star clusters and increase understanding of how galaxies evolve. The new Andromeda Project, set to study thousands of high-resolution Hubble images, is a collaboration among scientists at the University of Washington, the University of Utah and several other partners. Two teams of astronomers have used data from NASA’s Chandra X-ray Observatory and other telescopes to map the distribution of dark matter in a galaxy cluster known as Abell 383, which is located about 2.3 billion light years from Earth. Not only were the researchers able to find where the dark matter lies in the two dimensions across the sky, they were also able to determine how the dark matter is distributed along the line of sight. Dark matter is invisible material that does not emit or absorb any type of light, but is detectable through its gravitational effects. Several lines of evidence indicate that there is about six times as much dark matter as “normal,” or baryonic, matter in the Universe. Understanding the nature of this mysterious matter is one of the outstanding problems in astrophysics. Galaxy clusters are the largest gravitationally-bound structures in the universe, and play an important role in research on dark matter and cosmology, the study of the structure and evolution of the universe. The use of clusters as dark matter and cosmological probes hinges on scientists’ ability to use objects such as Abell 383 to accurately determine the three-dimensional structures and masses of clusters.